This has been a very challenging week for me – work wise, emotionally, and mentally. But thank goodness for horses and for this blog, where I feel more compelled to dwell on fun, positive things than on the negative. Sparkly pink crop – used to be my “show” crop, but I’ve since gained a modicum of traditionalist views…and a gelding! Now it’s my schooling whip and I save the black one for shows. Super easy to find if I accidentally leave it out in the ring! 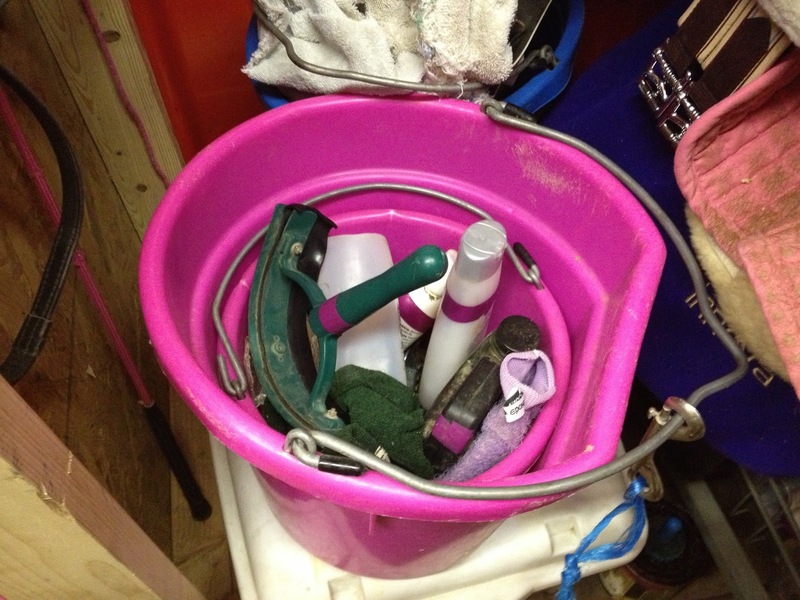 Bucket in a Bucket – Sometimes you need a bucket, and you don’t want to have to empty a bunch of stuff out of it to use it. By storing my small bath bucket in a larger empty bucket, I don’t take up valuable space with an empty bucket, yet have a large bucket readily available. 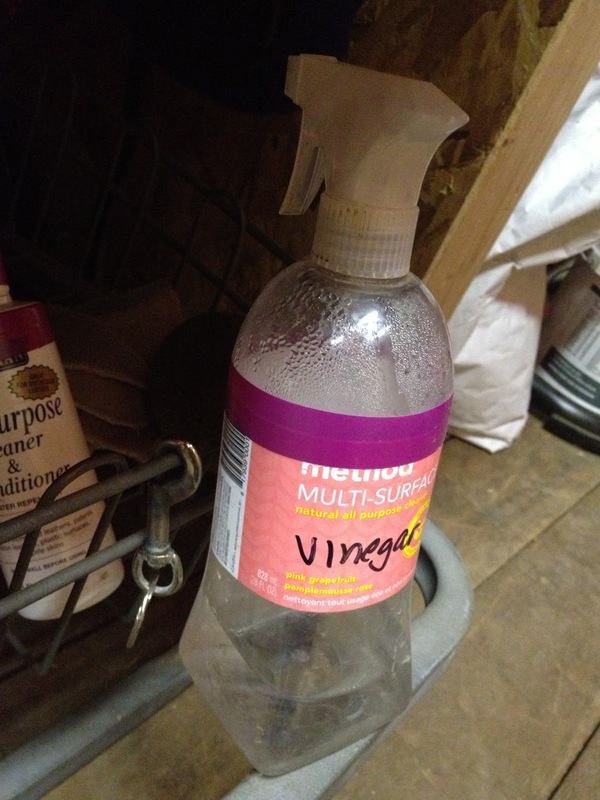 White Vinegar – I use it to clean out feed tub, grain buckets, water buckets, and mixing spoons. I don’t dilute it – I just spray it on things full strength, then add water and either scrub or hose off. Its a powerful cleaning and antibacterial agent, yet completely non-toxic of course. Oster brush – It is one of the mysteries of the universe as to why this brush works so much better than regular hair brushes. 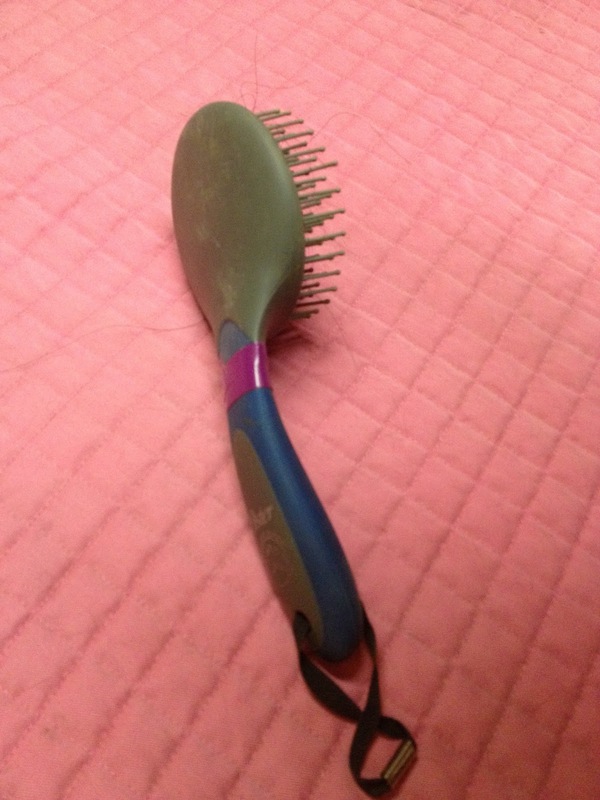 It doesn’t look especially high-tech, but I swear it brushes through tangles quickly, adds volume, and does not rip hair out! 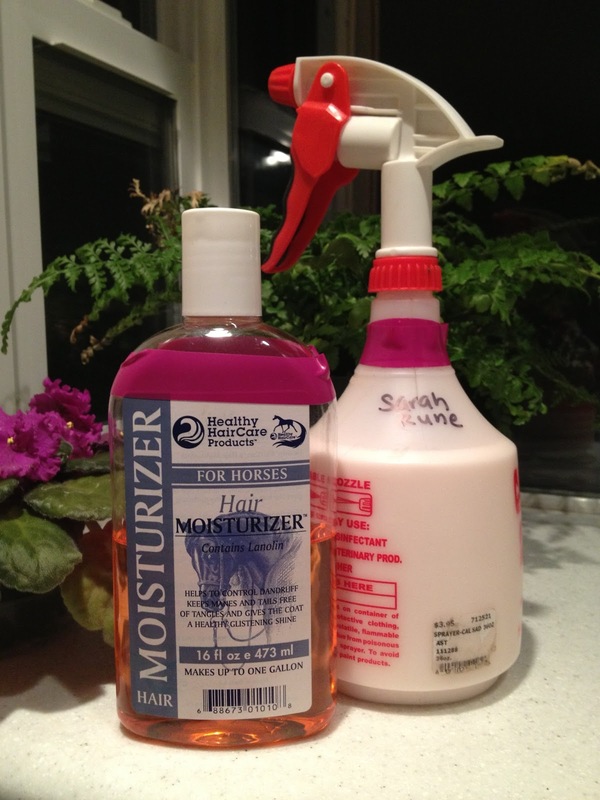 Hair Moisturizer by Healthy HairCare – Though its name is quite generic, the product is not. I’ve been spritzing Hemie’s body 2 or 3 times a week and generously coating the tail. It works great as a detangler which is helping his tail grow out, but it’s also a nice coat conditioner making the hair feel softer and look shinier. You dilute it quite a bit – one part moisturizer to 8 parts water, so this little bottle lasts a while! A bonus thing is in several of the above photos – pink electrical tape! 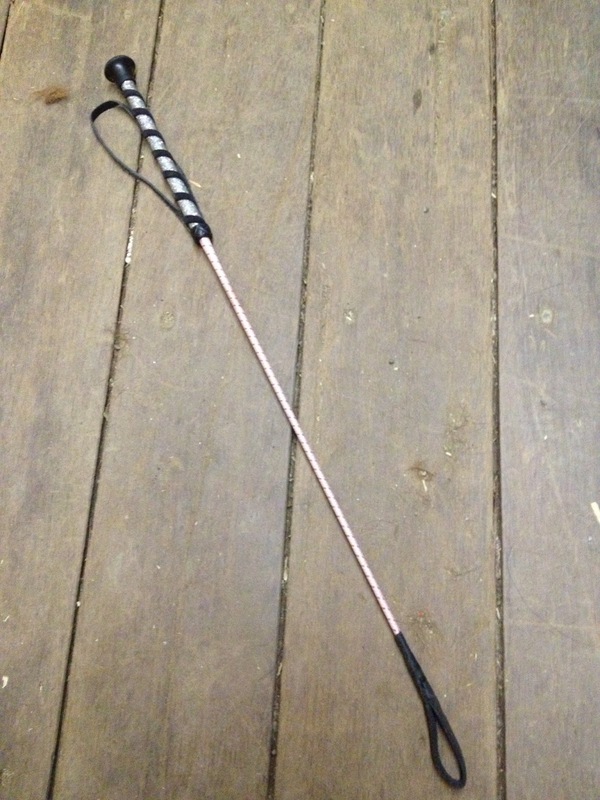 I have pink electrical tape on pretty much all of my barn stuff. It helps me keep track of stuff that is mine and helps reduce my things going missing. Bucket in a bucket is genius! I love the hair moisturizer product too. I've not used that moisturizer but have been looking for something that doesn't have silicone in it but doesn't attract dust like crazy. I'll have to try it, thanks for the recommendation! Love the pink electrical tape on everything, lol! I have a bucket in a bucket in a bucket, too. Great storage solution. I also keep all of my bathing stuff in a bucket hat has a hairline crack – leaks as a water bucket, but works perfectly for bathing supplies. I also LOVE pink! It was fun with my mare, but harder to pull off with two geldings. I need to give the vinegar a try – good idea. Love the crop! I have that Oster brush too and love it!